Mom, can you make me a quilt??? DD: Mom, can you make me a simple quilt? DD: well, you can buy some new ones! Me: I will be leaving in 2 weeks! 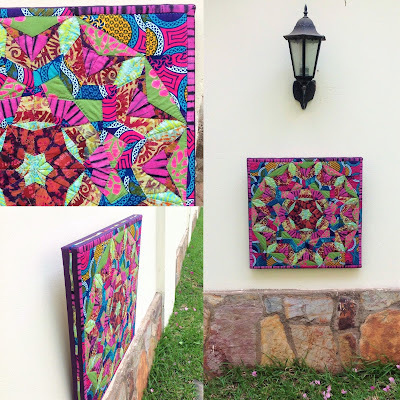 Well, what can you do when your child wants you to make a quilt and you like doing this? I have 2 weeks left before I leave for Sao Paulo and not much on hands, so why not! My DD has lived in Singapore for almost 8 years, during her teenage years, and during the wintertime she misses the tropics a lot. 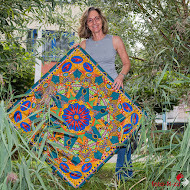 Can you imagine how happy I was to find a wide selection of Java batiks in a new fabric shop in The Hague?! They bring back good memories. I will cut blocks of 25cm square and sew them randomly in rows. This should be easy and quick, right? 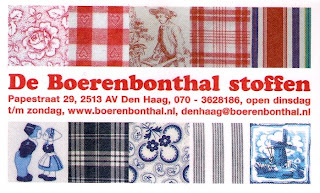 I you are interested in the new fabric shop, it is De Boerenbonthal Stoffen. They have a shop in Amsterdam and since November 9 opened their second shop in The Hague at de Papenstraat. 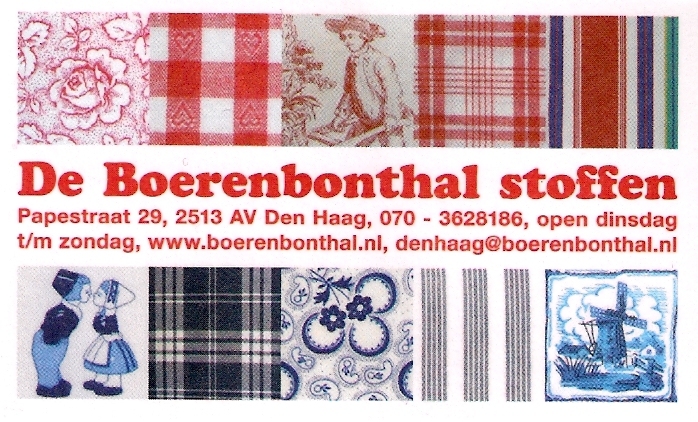 Java batiks and boerenbont (traditional farmers cloth), two traditional fabrics the Dutch have a lot to do with! One of the small things I wanted to do today was to finish this set of boxes. 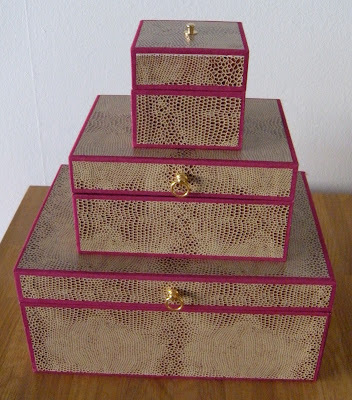 I made a box similar to the bottom one before, for a dear friend (click here). It turned out be such a nice combination of colours, that I wanted to make a few more in different sizes as you can see on these pictures. 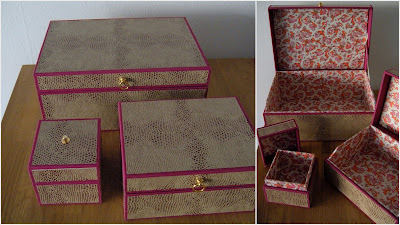 Covered completely in book binders linen, snake print paper on the outside and Italian paper on the inside and a small metal handle attached to the lid. Sizes are in cm: 24(w)x17(d)x11(h), 16(w)x12(d)x8(h) and 8(w)x8(d)x7(h). 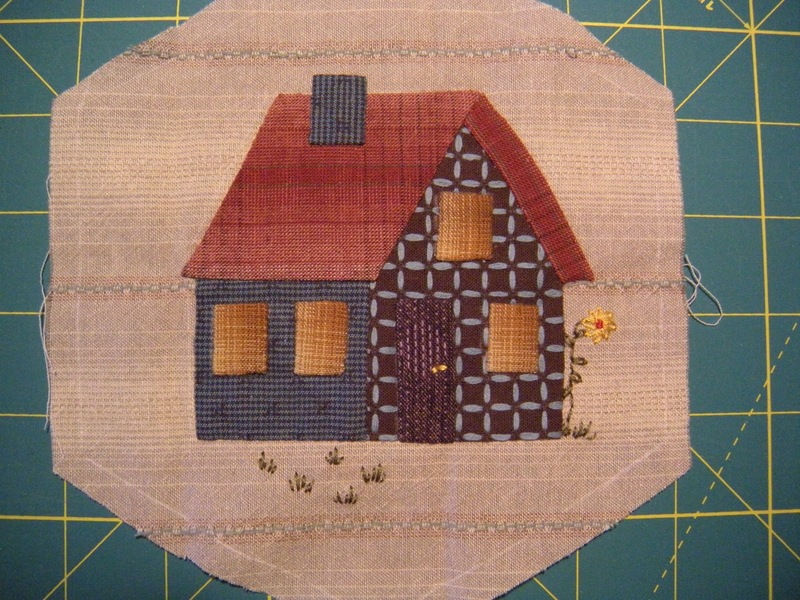 If you google 'house on the block' you get a lot of different options: ugliest, loudest, spookiest, coolest, best, looniest house... well, this one is certainly none of those, it is the latest one I made for my Dream House Quilt. Because that is what I still do: dreaming about our next house in Sao Paulo. With Cosmo embroidery threads, I have spruced up some houses I finished before. 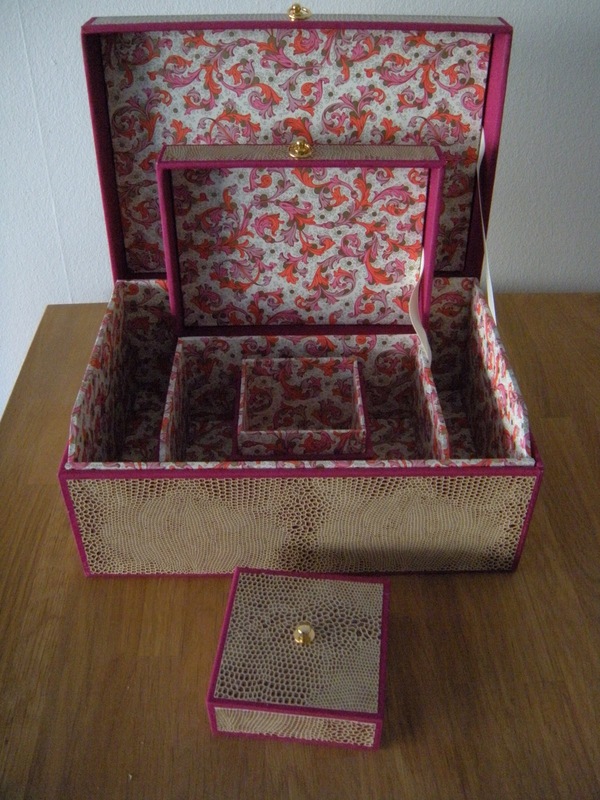 Our new home should have at least one room for my sewing and box making, some flowers in pots will be added and with the dogs there too it will be quickly my new best place to be! Because we have not found a place yet, I will stay in Holland for a few more weeks. More sewing can be done on this quilt while slowly the snowflakes will start covering the streets. Just hoping to be in Brazil in time for Christmas! And yes, I finished my Saturday project. It was an easy and simple design. 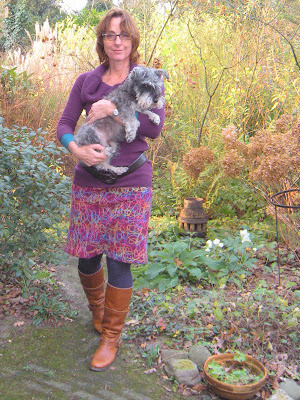 This is me in my mom's garden! Thanks for all of you who voted for my doggy and my quilt Floating Flowers over the past weekend in the quilt contest from the quilters gallery! I did not make it though; there were many other beautiful quilts you could vote for. Never mind. So let's get back to business! 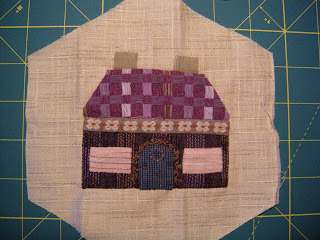 My parents were at my place for the weekend and I got a bit more quilting done on my UFO. Hopefully it will be finished before I leave for Brazil. I want to leave it behind in our apartment in Holland. 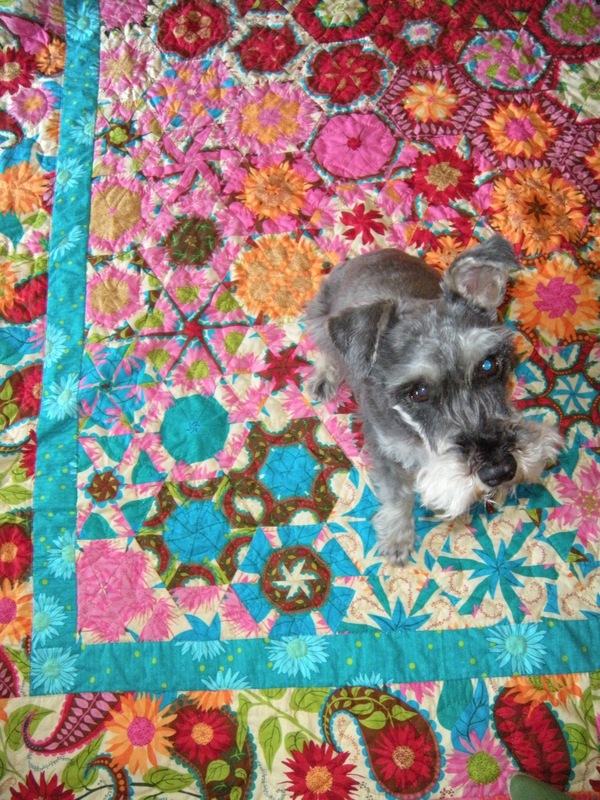 My Mini Schnauzer Spetter and my quilt Floating Flowers are entered in the Weekly Quilt Contest from Quilting Gallery. I hope you can take the time and visit us here. 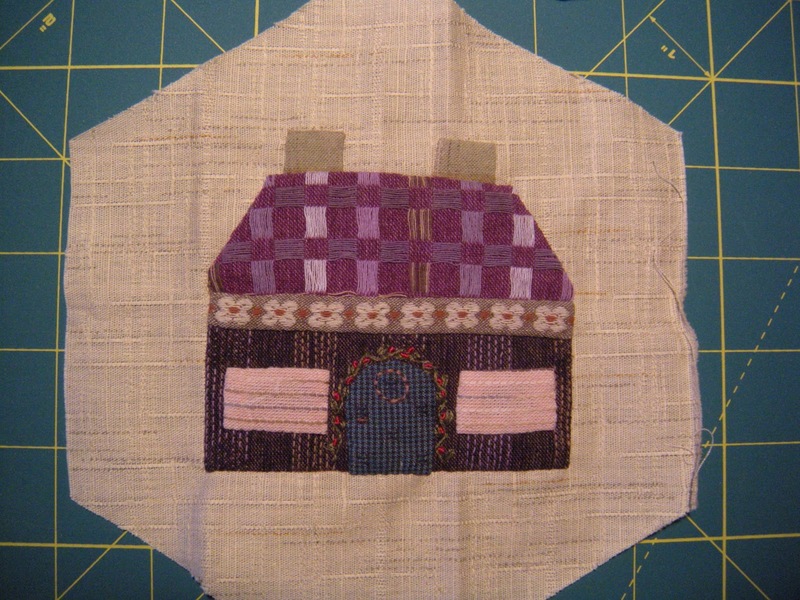 After you have chosen by clicking on the circular button next to the name, please scroll down all the way, until you get to the bottom of the names of quilts. Then press the VOTE button. Spetter and I need all your votes! Outside autumn is sending in rain and wind to play with the leaves on the streets. They even try to uproot some trees! Inside music plays and I think about the next house to design. Is it a coincidence we have to look for another apartment in Sao Paulo after the contract for our first choice did not come through and I am stitching houses on blocks? Ah well, at least I can keep playing with colours and dream of our next home. 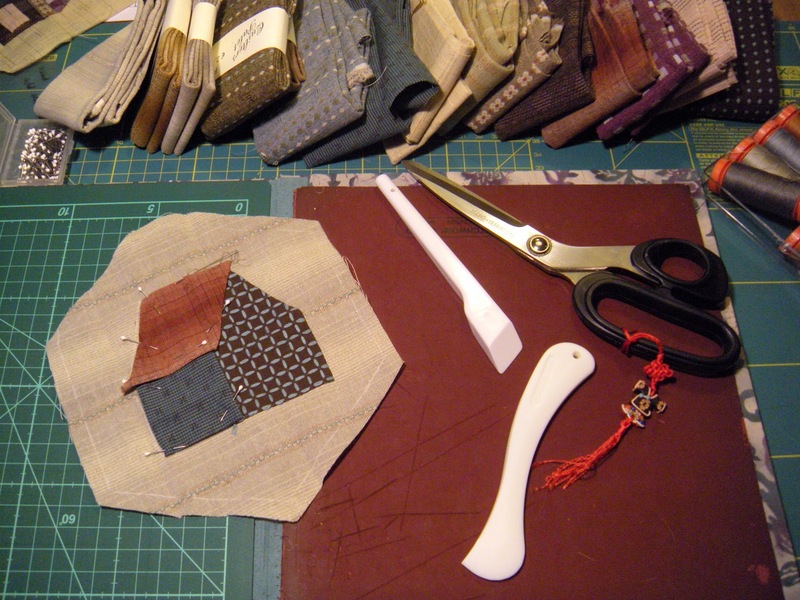 Last week I started a new project with Japanese fabrics. It is my first time working with this kind of material and their typical colours and I love it! Every fabric has a lovely woven structure and both sides are interesting. The blocks are all done by hand and my box with Aurifil threads comes in handy. The threads blend in so nicely! 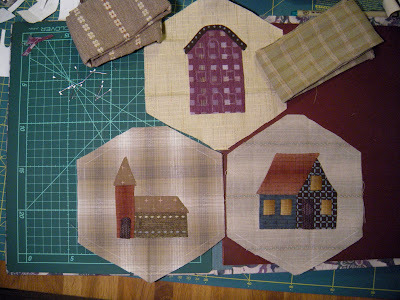 All blocks, 24 in total, have an applique of some kind of a house, like a tent, a lighthouse, a church, a windmill, a quilt shop, etc. Later on I will add some embroidery with Cosmo threads. 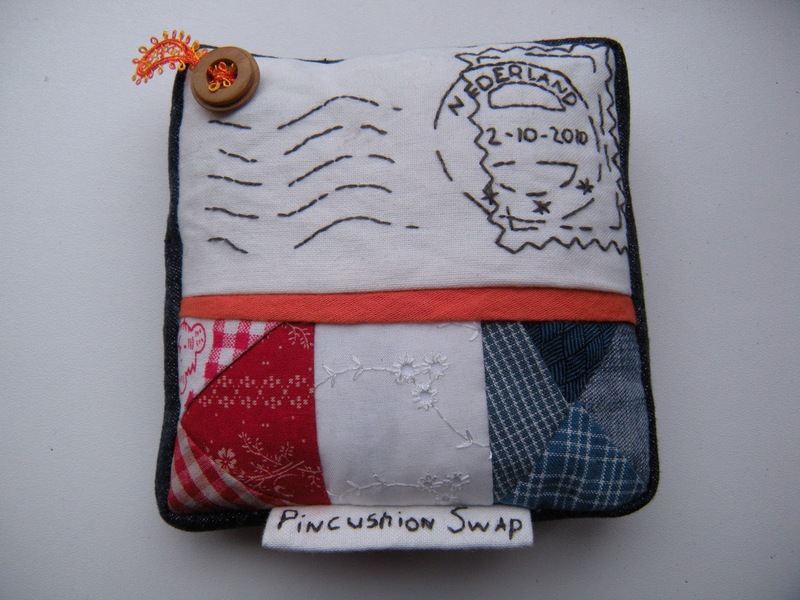 It is finally time to show a very special pincushion! This is the first time I joined a swap in bloggers' world and it was fun! When Jeannet organized a Pincushionswap in September, I thought yes, let's do this! 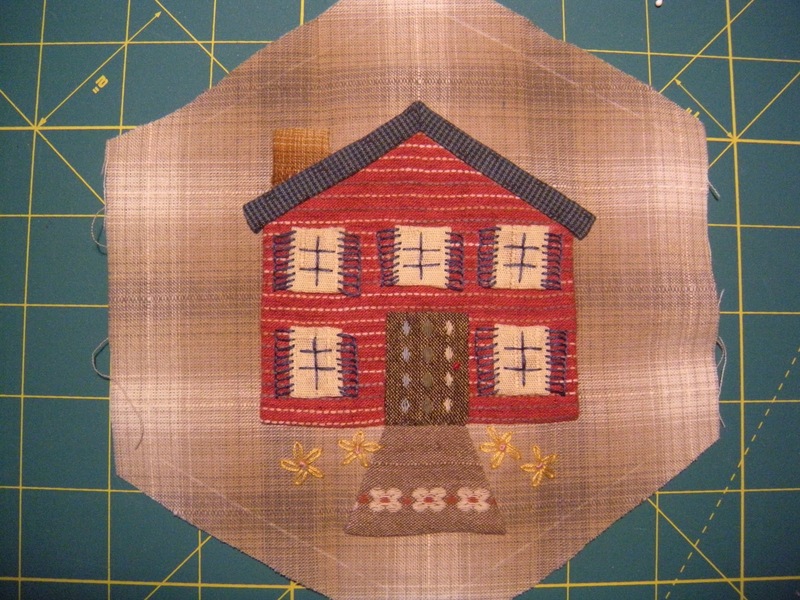 152 quilters joined in from Holland and overseas! I was linked to Hennie who also has a blog. 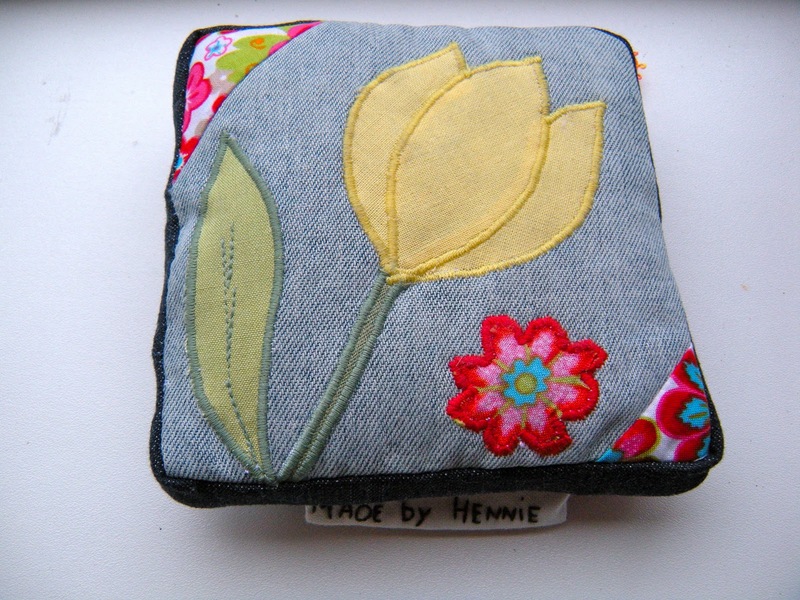 Hennie must be a thoughtful and experienced quilter because she really took the time to think about something that would suit me: she made me this very nice Dutch Pincushion! I was totally taken by surprise by the originality of the design. This pincushion is such a lovely and useful little piece of art I will treasure when I live in Brazil for a few years. Her use of Dutch colours on one side and the tulip on jeans on the other is clearly made with love. Thanks Hennie for your thoughtful present! My back is aching, but all boxes are cleared from my place and at the movers'. This morning I stuffed them all in a van and my Bernina was sitting next to me in the front. I told her to be brave and that I hopefully will see her again in about 7 weeks... That is, if all goes according plan and we can unload the container before Christmas!